Leupold 56410 Katmai 6x32mm Compact Binoculars FREE SHIPPING! Spot far off targets with impressive clarity using the Katmai 6x22mm Compact Binoculars from Leupold. Featuring an ergonomic body and powerful precision optics, this binocular is ideal for tactical operative, shooting professionals and outdoor enthusiasts of all kinds. Full sized eye pieces and 32 millimeter objective lenses work together create not only improved comfort but enhanced imaging quality. Multicoated lenses ensure maximum light transference where L-coated prisms can convert the light rays into a crystal clear image with bold coloring and distinct contrast. This allows users to easily make out fine object details from increased distances and in poorer lighting conditions. The Katmai's compact design is easy to hold with one hand and fits into cargo pant pockets for convenient transport anywhere. Waterproof seals and generous eye-relief add to its tactical functionality and versatile field applications. 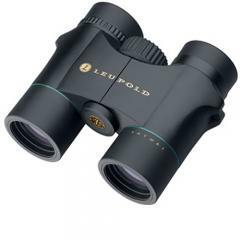 ©2002-2019 CopsPlus.com: Leupold 56410 Katmai 6x32mm Compact Binoculars FREE SHIPPING!